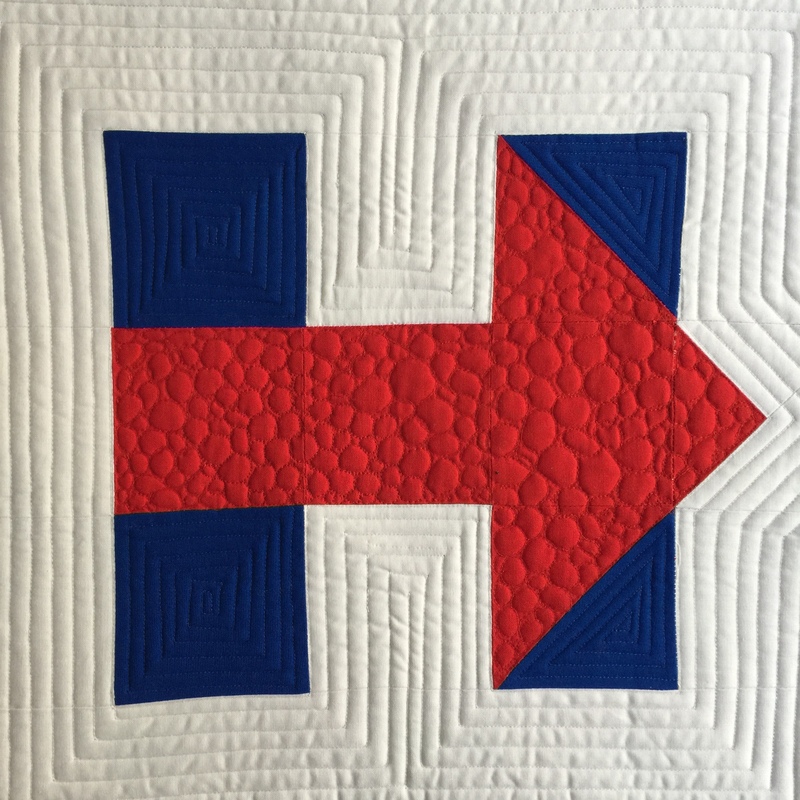 What else would a quilting Hillary supporter make but a Hillary for President logo quilt block? Was a perfect half square triangle pattern to figure out for myself. No matter what – exercise your right to vote!!!!! Love it, will have to give it a try! This is wonderful! Is there any chance you’re going to sell the pattern or make it available otherwise? I MUST make this! I just played with it and made it up. It’s mostly a nine patch with a few half square triangles to make the arrow. I just played around to get it. No pattern – guess I should try for that! May I ask the overall dimensions? Is it a 10″ block? If so, I think I can figure out the math. Thanks for this–I’m going to have fun with it. The point of the arrow is a quarter square triangle, right? The red point of the arrow is actually more flying geese (flying goose if singular?) I had to fidget with it a bit to make it line up perfectly with the half square triangles that were red in the blue. I made it bigger, then cut it down to make the seams match. I may try to make a tutorial… you are inspiring me! Lorraine, I think there are thousands of quilters who’ll be looking for a block like this to document this historic event. A tutorial would be very popular. I made two blocks today and am so happy with them. Mine are 10″, and I used a QST for the arrow point. Oh, and it’s about a 12 inch block finished. Making one of my own! What a great time to get started! Historic day – glass ceiling broken! Sure! Can you share your FB link to me, too?! Wow! I’m honored to be on your FB page! This is beautiful – fantastic piecing and quilting!